[photo by melissa golden, macon, ga. 092105] Senior Airman Andrew Paul Witt enters the courtroom at the Bibb County courthouse in Macon Ga. Wednesday afternoon. He was arrested July 2004 and is currently charged with two counts of premeditated murder for the slayings of Airman Andrew Schliepsiek and his wife Jamie Schliepsiek. From the archive: this story was originally published July, 21, 2014. The Bielenbergs stopped celebrating Independence Day after their daughter and son-in-law were stabbed to death at their home on Robins Air Force Base in Georgia early on the morning of July 5, 2004. But this year's milestone anniversary was not as bleak as it might have been. 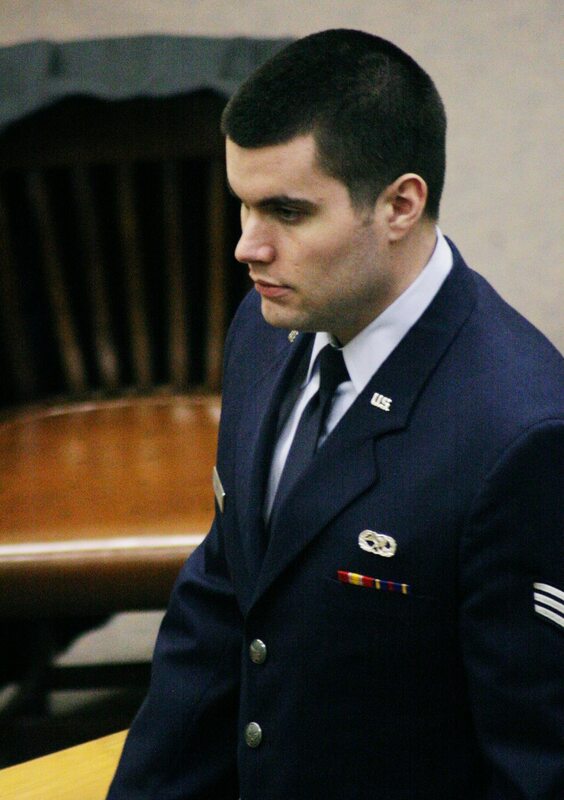 Ten years after the double murder of Jamie and Senior Airman Andy Schliepsiek, the U.S. Air Force Court of Criminal Appeals upheld the death sentence against their killer, a fellow airman named Andrew Witt. It was the first of two mandatory appeals all military death penalty cases must undergo. The 4-2 decision followed an uncertain year in which five members of the same court ruled in August to set aside the penalty because Witt's defense had failed to present certain evidence that may have persuaded jurors to spare his life. Two months later, on Oct. 21, the appeals court vacated that decision at the request of the Air Force and agreed to hear arguments again, this time with a full bench. The defense did not "shirk their responsibility," according to the most recent ruling handed down June 30. Had jurors heard additional evidence — particularly about Witt's alleged remorse, his possible head injury from a motorcycle accident 41/2 months before the murders and his mother's stay in a mental health facility when Witt was an adolescent — they would have returned the same sentence. "The Fourth of July weekend is never a very happy time for our family. That day just brings back a lot of terrible memories. The phone call and being told what happened," Jamie's father, Jim Bielenberg, who lives in Texas, told Air Force Times. "The [June 30] news made it better. It at least reaffirmed the decision by the jury. Now we move on to the second appeal." Witt and his defense have 30 days from the Air Force appeals court's most recent decision to file a request for reconsideration, said Roger Bruce, associate division chief of the government trial and appellate counsel division. "They can go back and ask [the court] to take another look at what they have just decided. That is the next step," said Bruce, who has worked on the case on behalf of the government for eight years. "If they don't file a request for reconsideration, then the judge advocate general will forward the decision to the U.S. Court of Appeals for the Armed Forces for a mandatory appeal." The Schliepsieks celebrated Independence Day 2004 at the home of friends and neighbors, then-Senior Airman Jason King and his wife. Sometime after midnight on July 5, Jamie Schliepsiek confided that Witt, a co-worker, had tried to kiss her a couple of days before. Andy Schliepsiek called Witt and confronted him with the accusation just after 1:30 a.m., according to trial testimony. There were several phone calls back and forth. Eventually, the calls ended, King recalled in an Air Force Times interview in October, and he figured the matter was dropped. Around 3:30 a.m., King and the Schliepsieks went back to the Schliepsieks' base duplex less than a quarter of a mile away. Witt was already stalking them by then. He changed into his Air Force fatigues, put a combat knife in his car and drove on base, parking far enough away from King's house so he wouldn't be seen. Witt watched them through some trees for at least an hour, following them to the Schliepsieks'. He attacked Andy Schliepsiek first, then turned to King when he tried to intervene. King was stabbed multiple times, mostly in the back, but managed to run for help. Witt stabbed Andy Schliepsiek three times. The second blow severed his spinal cord, paralyzing him instantly. The injury wasn't fatal. The third, in his heart, was. Witt, who later said he didn't want to leave any witnesses, broke down the door to the bedroom where Jamie Schliepsiek was cowering. He broke her arm, stabbed her five times and removed her skirt as she bled to death. Any one of a number of King's injuries should have killed him. He endured multiple surgeries and spent weeks in the hospital recovering. He medically retired from the Air Force in 2011 after he was diagnosed with a breathing condition, likely a result of the scarring on his lungs from the attack. Less visible scars — post-traumatic stress disorder and the drug and alcohol addiction that manifested after the ordeal — persisted for years, King said in October. Fifteen months after the attacks, a military panel of 12 officers convicted Witt of the premeditated murders of the Schliepsieks and the attempted premeditated murder of King. On Oct. 13, 2005, after nearly 12 hours of deliberations over three days, the jurors sentenced Witt to die. He is the first airman sentenced to death since 1992, although the Air Force last executed one of its own in 1954, according to the Death Penalty Information Center in Washington, D.C. The military has not carried out capital punishment since 1961. The last Air Force death sentence, handed down against Senior Airman Jose Simoy for his role in a robbery and murder in Guam, was overturned on appeal. "To me, [Witt's sentence] is a no-brainer," Bielenberg said. "If you don't put someone to death for this, I don't think you're going to put them to death for anything." Witt's defense raised 89 issues in objection to his conviction and sentence. Before vacating its decision to set aside the death penalty and agreeing to hear the case again, the Air Force appeals court had ruled that three of those issues could have affected the outcome of Witt's sentence. In the June 30 opinion, the court disagreed, writing that the motorcycle accident — which the defense argued could have caused a traumatic brain injury that led him to commit the acts of violence — wasn't that severe. Witt had crashed his bike about two blocks from home. He'd gotten up and driven it two miles to work and sought medical attention only at the insistence of a co-worker. He was admitted and released the same day. Further, the court wrote, only one out of some 100 people interviewed said they'd noticed a behavior change in Witt after the accident. Two weeks before the murders, Witt had taken a week-long golfing vacation in Europe with his father, who testified he hadn't noticed anything at all amiss with his son. The court also disagreed that Witt's mother's mental health history would change the sentence. "There is no dispute that [Witt's parents] come from upbringings troubled in various ways, and that [Witt's mother] was diagnosed with depression and suffered from stress at various points in her life" and was treated at an inpatient counseling facility for 17 days when Witt was in 8th grade, the court wrote. "Likewise ... [Witt's father] struggled with drugs [and] he and [Witt's mother] divorced when [Witt] was very young. ... It is quite another matter, however, to suggest that these facts, had they only been correctly presented to the members, would have made the difference between a life and death sentence." Similarly, the court found, testimony from a sheriff's deputy who witnessed Witt break down after seeing the crime scene photos for the first time wouldn't have made a difference, either. "The overwhelming weight of the evidence paints a picture of a cold, calculated, vicious crime, carried out in the furtherance of a purely protectionist and self-serving objective," the court wrote. Jamie Schliepsiek would have celebrated her 35th birthday this month. Her family is instead bracing for the next mandatory round of her killer's appeals. "We never thought the first one would take this long. We just don't know what to expect anymore," Bielenberg said. He hopes the second appeal will move faster than the first. "Capital litigation, especially in the military, is not a fast process," said Bruce, who was the colonel in charge of the government trial and appellate counsel division when the case first came to his office in 2006. "It is long but it is also kind of the norm. There are six servicemen on military death row at Fort Leavenworth, and the oldest one ... has been in litigation for more than 20 years. These things don't go fast. That's a proven fact," Bruce said. The next step for the Witt case — the U.S. Court of Appeals for the Armed Forces — typically takes 18 to 24 months, he said. "It could go faster or slower than that." If the court upholds the death sentence, Witt's defense could appeal to the U.S. Supreme Court, which would decide whether to hear the case. After that, the president, as commander in chief, "would decide whether to sign the death warrant," Bruce said. Or Witt could try to litigate his case in federal court. "That's why cases can drag out for 20 years," he said. For the Bielenbergs, "it's an obvious decision. It's just amazing what you have to go through to put a guy like this to death," Jamie's father said. Meanwhile, the loss of their daughter remains poignant. "We have pictures of Jamie up in the house in the main hallway. You walk by it every day," Bielenberg said. "It never goes away. It lives with all of us."